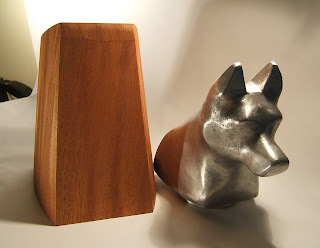 For my final in my Materials of Art & Design class (essentially shop class), I created an urn for my dog. No, he's not dead yet. Kinda creepy and morbid, but I wanted him to have a nice resting place rather than be thrown in a ditch with all the other dogs. I feel that he deserves more than that. I even kinda cried in class about it during my final presentation. I didn't think it meant that much to me, but I guess the thought of my old dog dying got to me. 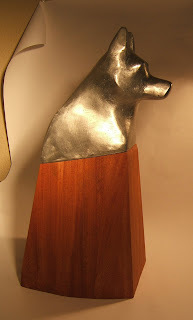 Front view of my dog urn. About 18" high. Side view. About 8" wide. The top is made from aluminum (from recycled cans). 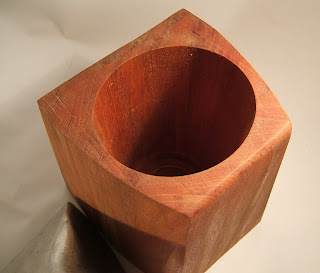 The bottom is made from Honduran Mahogany. This is what the inside of the base looks like. It's a lot harder and more expensive to make than you'd think. Losing a pet can be a very painful experience.One of the best way to honor your pet is by providing him with a nice resting place, such as a dog cat urns uk for ashes.